A rare beauty of a dinosaur art print that brings the ancient past to strikingly vibrant life. The dinosaur Kritosaurus represents the joy of individuality. This 9 x 12 inch limited edition fine art reproduction is available framed or unframed. Kritosaurus is a dinosaur that celebrates being different, because different is good and makes the world so much more fun to live in. © Kristen Girard | Tired of blending in? Being and feeling like a number? Then this art print of the dinosaur Kritosaurus is for you! Celebrate all the little things and big things that make you unique and truly special with this dinosaur that wasn't afraid to stand out from the crowd and simply be herself. To find our more about the story behind this Kritosaurus painting click here. Dinosaurs didn't worry about what everybody else was doing. They did what they needed to do to express who they were. They were individuals who embraced their differences, because different is where the delightfully unexpected and refreshingly good things in life grow from. When we embrace what makes us unique we feel free and happy in a way we never can when we are busy trying to blend in. Talk about the things that light you up because when you do, your eyes sparkle with fun. Go out and visit that museum, spend the whole day taking it all in like you have been wishing to do for years. Let go of the worries about being accepted or not. The truth is, the more you are your authentic self, the more delightful you are to be around. And this people who don't get you and try to bring you down? Let 'em go. Walk away. The world needs you to be your unique self, much, much more than you know. Kritosaurus was a super cool beaked plant eating dinosaur that may have had an inflatable crest. She thrived in the area we know call New Mexico during the late Cretaceous period from about 76 million to 65 million years ago. Isn't is so awesome to think about how dinosaurs LIVED on the very same planet we do? Each print is inspected by the artist for the highest quality and true to the original color. Due to the care and craftsmanship that go into creating each print and frame, your order may take 3-4 weeks before it is ready to ship. Please plan accordingly. 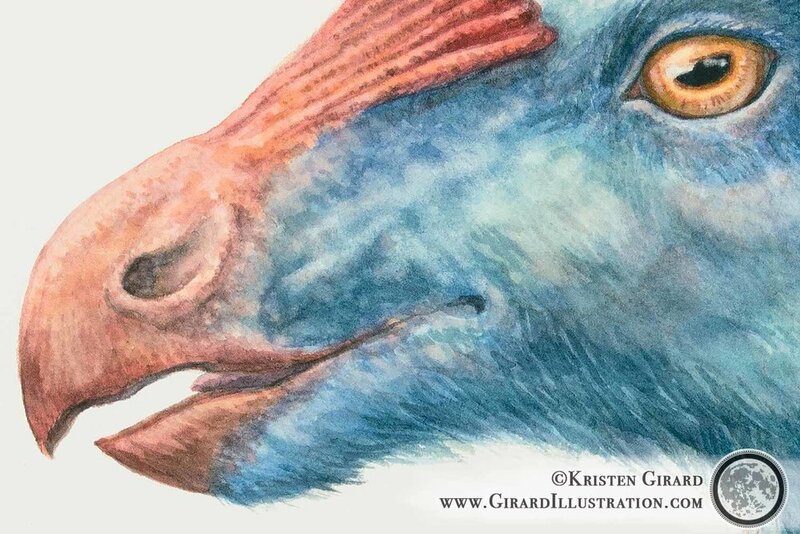 © Kristen Girard | Dinosaurs were adaptable and enduring for spans of time that as humans we can barely imagine. A million years... that spun into nine million years of individuality and lives upon lives lived well in the case of Kritosaurus. Our prints may not last a million years, but they will last your lifetime and beyond because they are made with only the highest quality materials. Made with gorgeous matte paper and amazing inks! Your master quality print will be bright and beautiful for years to come. Certificate of Authenticity direct from the artist, so you know your print is the real dinosaur loving deal. Choice of limited edition print number on a first come, first served basis. Based on availability, you can choose a special number from 1 to 2,389 when you are checking out. If your number has already been taken, you will be sent the lowest available number. Each limited edition print comes with the Artist's Guarantee that there will only ever be 2,389 official 12 inches wide by 9 inches high prints. This means that each limited edition print is truly special and rare. You can purchase each print framed or unframed. Custom hand made frames are specially chosen by the artist to make each artwork look stunningly beautiful for years to come while setting the art off beautifully like jewel. You will get compliments about your art! Each print is inspected by the artist for quality and consistency. Due to the care and craftsmanship that go into each dinosaur print and frame, your order may take 3-4 weeks before it is ready to ship. Please plan accordingly. To make sure your framed dinosaur art print looks amazing for a lifetime, we took care of al the details for you. Gorgeous frames hand crafted with an eye for strength and beauty. Matts both set the artwork off and protect it. Glazing that has little to no glare under most lighting conditions....you deserve the best, so we only do the best. 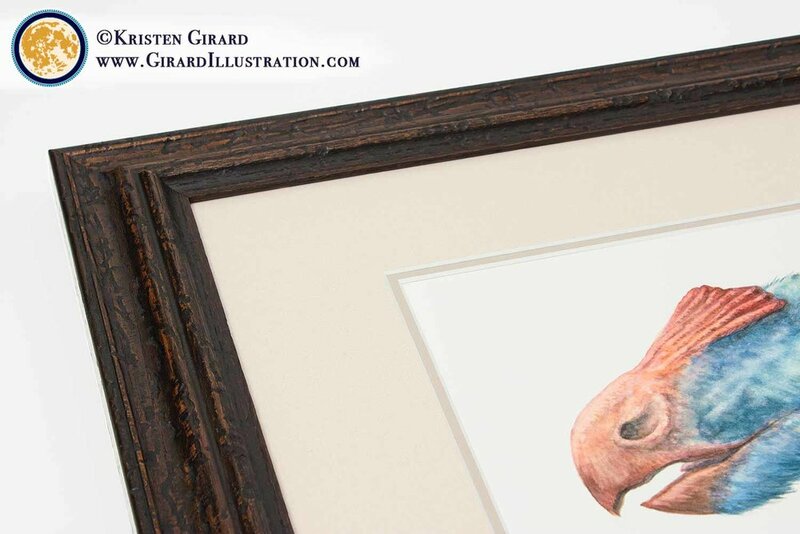 To find out more about our artist chosen framing click here. Framed artwork is ready to hang right out of the very sturdy shipping box (we wrap your art up tighter than Fort Knox and prepare it to adventure through the postal system like a champ - so you'll have to unwrap it first, but other than that, when you buy framed art, it truly is ready to hang and look amazing)! To find out more about why our frames are the best click here. Get inspiring art + story letters.